Toad, the hero of this story (or Mushroom-head to his mates) gets to show off his muscles in this Tetris-style falling block game by lifting and stacking bombs and monsters. 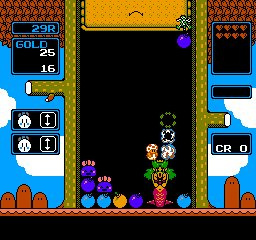 Our friend Toad cleverly discovered that if he puts monsters of the same colour in a row along with a bomb of the same colour that they will disappear. What a random discovery! Things start off quite simply but before long you have to deal with monsters of many different colours, so you will really have to concentrate. Before long the gameplay can get quite frantic as you desperately move stacks of monsters around trying to make a chain. In addition to all this there is a fun two player head-to-head mode, as well as boss battles. 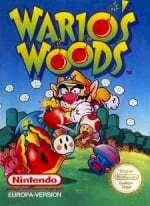 Whilst this is a fun puzzler it’s a shame Nintendo didn’t put the superior Super Nintendo incarnation of the game on the Virtual Console, which has a more comprehensive array of gameplay modes and stronger presentation. Wario’s Woods is fun for a while but enjoyment for most will no doubt be short-lived. If you are a fan of falling-block style games you will no doubt get pleasure out of this but there really isn’t anything original to see here. Wait and see if Dr. Mario or one of the more established Nintendo puzzlers shows up on the Virtual Console, your money would be better spent there. The Super Nes version of this game is better.If you want this one then it should be a very very very last 500 Wii Points left over game if you want to get it. I would have given this an 8. It's very addicting and fun. The visuals not being as good looking doesn't bother me. 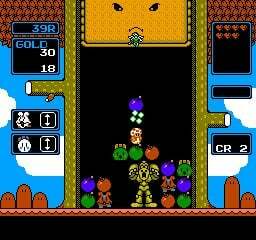 The gameplay and music are there and it's simple, yet challenging, like all great Nintendo puzzlers are. I just got the SNES version, man it's addicting. You guys should have reveiwed that one instead.